How to Smoke Meat in an Electric Smoker? 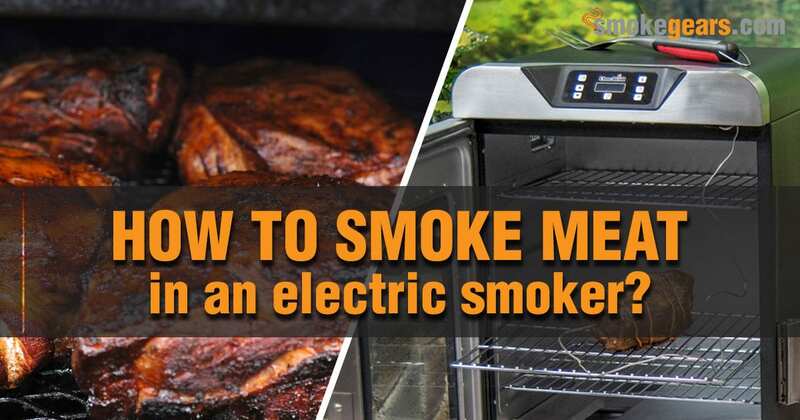 →How to Smoke Meat in an Electric Smoker? Sure they're a bit bulky and require a great deal of space for grilling. But when it comes to grilling with an electric smoker, ease, convenience, and timeliness, are three factors you can't knock them for. The best electric smokers are quick, efficient, and will allow you to grill any meat, to the ideal internal temperature. For those who want to learn how to smoke meat in an electric smoker, we’ll delve into it below. Whether you buy the best electric smokers under 200 or spend thousands of dollars on one, convenience is something you can't put a price tag on. Using the best manual meat grinder allows you to create a burger, sausage, or other cut of meat to the desired texture/consistency. Your electric smoker is going to make your life a cinch when grilling these meats on it. An electric smoker has a push-start button. No guesswork. No need to continually add water, or check in on temperatures. A novice or beginner can use it, and will grill meats to perfection with the slightest of ease. Sure some purists knock them, but if you want consistency, simplicity, and limited work on your behalf, you can't go wrong with the electric smoker. They are relatively inexpensive, work well in warmer temperatures, and require less space for setting up. They look like a refrigerator, and have a temperature gauge so you can control temperatures. Depending on space limitations, weather (vertical smokers are best for warm weather climates) and type of meats you grill, every individual will choose something different. Yes, it is self-explanatory in most cases. But it is still worthwhile to read your manual. Not only so you understand the temperature setting, but also so you know the design and features of your smoker. Also this allows you to understand what type of meats you can smoke, timing issues, and other questions you may have about the smoker. By familiarizing yourself with the smoker, you will find it far easier to set up and forget. And, it won't require a learning curve when you are actually grilling for a crowd. So you know the meats are going to come out to the desired temperatures, and taste great when using your smoker. Prior to using the smoker you might have to season it. You simply do this by turning on the smoker and adding wood chips to achieve the smokiness factor in the chamber. Simply run the smoker for a couple hours prior to use. Let the vents remain open atop so they can properly ventilate airflow. Once properly seasoned you are ready to go. It is best to season your meat with dry rubs. And you should do so overnight if you have the time to do so. When you season in advance, the meat fully absorbs those flavors. And when grilling it, they will spread evenly throughout in your smoker. Better taste, consistency, and juicier flavor when you take the meat out of the smoker. Your push start button on the front of your smoker should be activated. Allow it to preheat to the desired temperature. From there, you are going to place water in the receptacle. You are also going to add wood chips to the side slide tray for the best grilled flavors. Again, each grill is different, so reading the manual will payoff prior to using it. Depending on the type of wood chips you are using, some require longer or shorter grilling times. So keep this in mind to avoid overly smoked or rich flavors when grilling. Especially when you are new to grilling, you should experiment with different flavors. Doing so will make your life easier, and allow you to achieve the best taste and consistency each time you are grilling in the smoker you are using. You are going to set the temperature on the LCD panel based upon the best type of meat you are smoking. Your smoker is easy to use because you simply choose the meat, desired grill time, and desired temperature. Some have preset settings built in as well, so experiment with these as well. Your smoker is only an indicator in terms of temperature. So, as is the case with any grill you use, it is best to have an external thermometer as well. Not only for the most accuracy in temperature reading, but also to ensure can you fully control grill times. Each grill also has a count down or up timer; so if you have to step away, you can do so when using your electric smoker. Now that you've set everything up, it is simply a waiting game. The electric smoker is truly simple to use. It is simply about choosing the grill times or temperature desired, and it will work its way up from there. You might have to add water every 30 to 45 minutes, but apart from that, there isn't really much you are going to have to do when using it to smoke meats. Once the meat has reached the desired internal temperature it isn't ready for consumption. You need to let it sit for a while. Here you will place it in the smoker chamber rack, to allow it to cool. This allows the flavor/seasoning to blend into the meat a while longer as well prior to consuming it. Once fully cooled, and once the meat is at the ideal temperature, you are ready to consume it. One of the beauties of the electric smoker is the simplicity and elimination of having to do manual labor when grilling. So whether you are new to grilling or simply want to know how to smoke meat in an electric smoker, these are a few simple tips to get you started. Your new smoker is easy to use, smoke meats evenly, and offer a variety of features even new grillers can appreciate.